High school freshman, Ten Serizawa, has a two-hour commute through the mountains, both ways, in order to attend Nekochiya High School. Ten's friend, Ageha Haruno, suggests that she move into the boarding house where Ageha stays. If she does move in, Ten will have to contend with three high school boys who, to varying degrees, are attracted to her. As Shortcake Cake, Vol. 3 (Chapters 12 to 17) opens, Ten and fellow housemate, Chiaki Kasadera, pretend to be a couple so that 16-year-old, Rei, can stop pestering Ten for dates. Meanwhile, Ten is confused about her feelings for Rei's older brother, another housemate, Riku Mizuhara. Not long ago, Riku told Ten that he liked her, and though she was gentle, she rebuffed him. Now, Ten is having second thoughts, and she might have an opportunity for a second chance. THE LOWDOWN: The Shortcake Cake manga is still like the reading equivalent of a warm cup of cocoa. Shortcake Cake is a bit off-beat as far as shojo high school romances go because it is set in a boarding house, but the setting allows for constant teen romantic angst. Shortcake Cake Graphic Novel Volume 3 focuses on the love that might be between Ten and Riku. Ten seems so wishy-washy and conflicted about romance that this alone makes for enjoyable teen romantic melodrama. Creator suu Morishita is good at conflict and confusion, which is in abundance here, and Emi Louie-Nishikawa captures the malaise in captivating English. Where to from here, Ten? 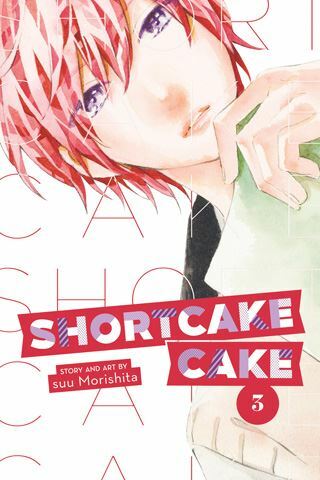 I READS YOU RECOMMENDS: Fans of high school shojo romance will want to read the “Shojo Beat” title, Shortcake Cake.